Among the company at Port Royal was Louis Hebert, an apothecary from Paris. After the abandonment of this colony in 1613, he returned to his shop. In 1617 his old friend and associate, Champlain, induced him to come out with his wife, Marie, and their three children to the new settlement at Quebec. They received a grant of land on the summit of the cliff, not far from the fort, but a mile away from the houses of the fur traders on the water side below. Here they made a clearing of seven acres in the forest and began to till the soil. The work was hard, and the life lonely and perilous, and for years their little farm was the only attempt at real settlement in the country. Madam Hebert was a good housekeeper, a woman of courage and kindliness; she worked in the field herself, and brought up her family in habits of industry. After years of struggle they succeeded in establishing a home of modest comfort and prosperity; they had built the best stone house in the colony, and had gradually extended their property. In 1627, Louis Hebert died as the result of a fall. With her son-in-law, Guillaume Couillard, Madame Hebert carried on the work of the farm, during the troublous times of the war with England. When, in July, 1629, Quebec fell into the hands of the English, the soldiers, the missionaries and the officials of the fur company, and such of the settlers as desired to leave were taken back to France. Marie Hebert was free to return to her native land with them; but she decided to stay on the soil that she had made her own by so much labour and suffering, and where her husband and some of her children were buried. Her son-in-law and his family remained with her throughout the years of English occupation. They were there to welcome the return of their countrymen in 1632, and Marie lived for seventeen years longer, devoting herself to the care of the sick, and the training of Indian girls. Today, numerous French-Canadian families trace their ancestry back to this estimable woman, who may truly be called the Mother of Canada. 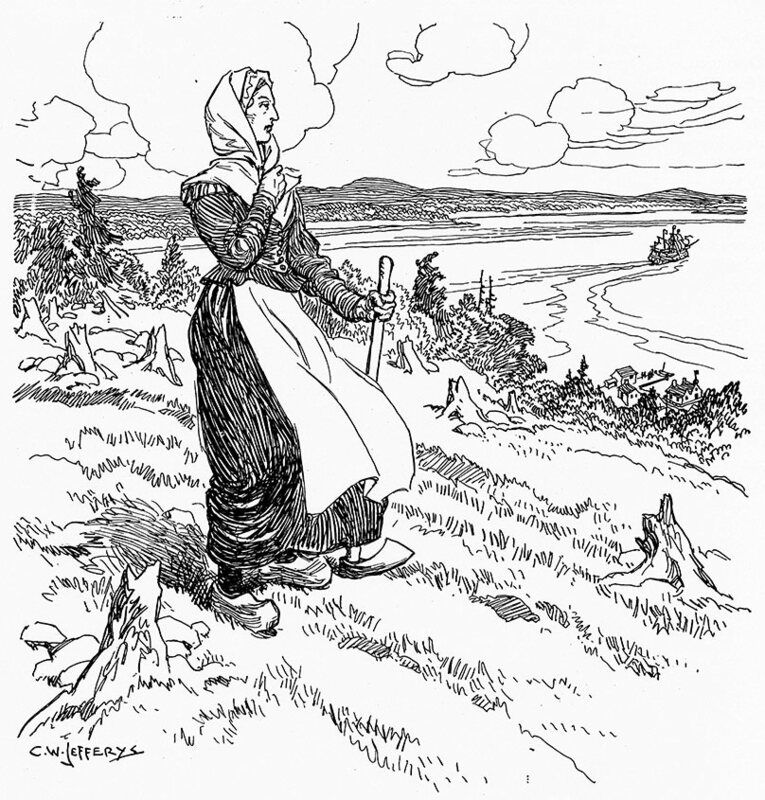 In the picture she is seen watching from one of her fields on the edge of the cliff the departure of the last English ship bearing away the French colonists. At the base of the cliff is shown a glimpse of the wharf and the buildings of the habitation, while in the distance extends the Beauport shore of the St. Lawrence. Marie wears the kerchief, the short thick jacket and heavy skirt, and the wooden shoes of the pioneer women of that time. The clumsy mattock or hoe, used for breaking up the ground, and the stony field beset with stumps suggest the hard rough work to which she had set her hands.